I remember that I went to New York when the Klimt paintings went on display at the Neue Gallerie after the legal settlement. It was wonderful to see them up close. 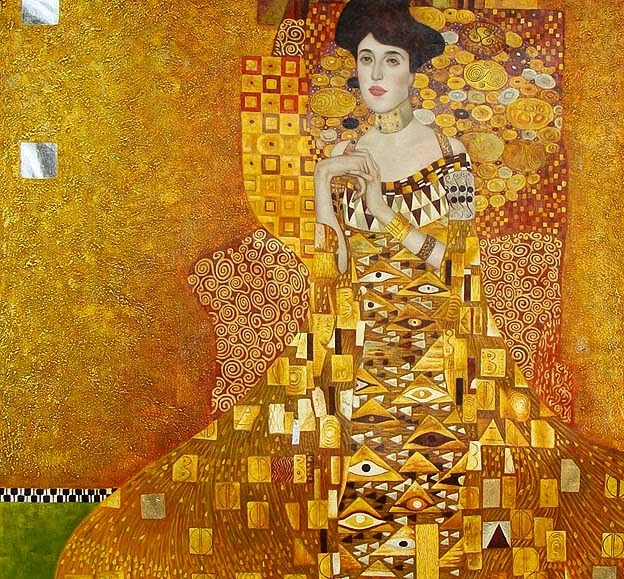 So it is only fair that I should see the Woman in Gold movie. I liked it much more than I thought I would. It was a beautiful and emotional film. Helen Mirren is the best. I tend to feel that art belongs to everyone and should be on display, and that wasn't the point of view of the movie. They made it clear that if the museum owners had behaved respectfully at any point she might have decided differently. I feel myself that being treated with respect is what matters most. She plays a song on her victrola, and I was pleased to recognize Schubert's "Du bist die Ruh." And at the wedding he sings "Deh Vieni a la finestra" from Don Giovanni. I must add--the most amazing thing about this movie is that they found a German speaking actress who looked exactly like Adela Bloch-Bauer. I agree it was a very emotional film. I worked in the art business in the late 1970s (in Minneapolis) for a guy whose parents were art dealers in Belgium and had the foresight to emigrate to Canada in 1938 (with, as he used to say, just one Picasso and a Monet between them). Mirren should easily earn an Oscar nomination for this, especially since Academy members always seem so fond of voting for biographical characters. Too bad Ryan Reynolds was cast at the attorney. As my grandmother would have said, "He was a lox onscreen."